We are part of a generation that went to the moon and back. New technologies and designs are changing life as we know it. These changes affect grown ups as well as little children. However, unlike adults kids have little say in influencing these transformations, even though their future depends on it. 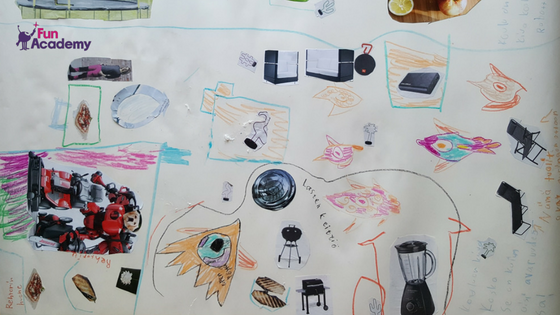 So we asked a group of 26 eight-year olds to design a classroom from the future when travelling to space is an everyday task. Their vision was truly inspiring. More importantly, it shows the impact modern technologies and designs create in the world of children today. 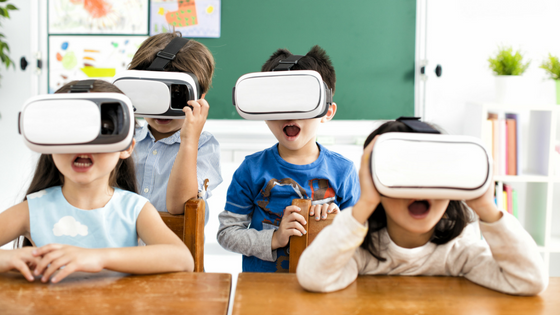 Look into the future through the eyes of a child and discover the features of a futuristic classroom! Learning in the future will be dominated by a ‘Maker-Culture’ where kids are encouraged to experiment, design and create. So the classroom itself will support this by having plenty of areas, material and tools necessary to make things. Children will put their knowledge into practice immediately. They will have means to search for more information and find answers to problems they face along the way. A futuristic classroom will support learning to solve problems in the real world. Classrooms from the future will have no books. We will use interactive whiteboards, tablets and sophisticated computers to teach and learn. This may sound like a no brainer to those of us who have opted for a paperless lifestyle. But for these kids books are still a quintessential part of their everyday learning environment. Therefore, this is a strong nudge for adults to extend the technology and its perks we enjoy today, to little children as well. In the future Artificial Intelligence (AI) will lead lessons within classrooms. What this means for human teachers is that their own pedagogical education and training will include how to program AI. Following which they will direct AI on how and what to teach. In return we can assign one or more AI for each learner creating a truly personalised learning experience. How amazing is that? It’s important to remember that envisioning robot principals or AI teachers is not part of a sneaky plan to get rid of human academic staff. But rather it’s a group of 8 year olds attempting to integrate technology into their classrooms in a meaningful way. What could happen in reality is school principals can assign tedious paperwork and other administrative tasks to robots. Then principals can spend more time with teachers, students and parents, collaborating to lift education beyond the space era. A futuristic classroom never stays in one place. In fact the whole school will float around, which of course would make morning drop offs and afternoon pickups interesting for parents. However, this feature is inspired by the idea that ‘learning can happen anywhere’. Out of all the places learning environments should be the ones which are most dynamic, agile and constantly evolving. A floating school is children’s way of saying they are ready to take off from sitting behind desks all day, to learning in more inspiring spaces. Classrooms in the future will have great big kitchens with plenty of raw ingredients as well as ready made food. On one hand little kids can learn how to cook their favourite food. On the other hand they can eat whenever they feel hungry. Not having to stick to strict meal times will save them from starving between meals. Furthermore, it will also help them to learn and play effectively without the distraction of a rumbling stomach. 7. A futuristic classroom is classy but practical! 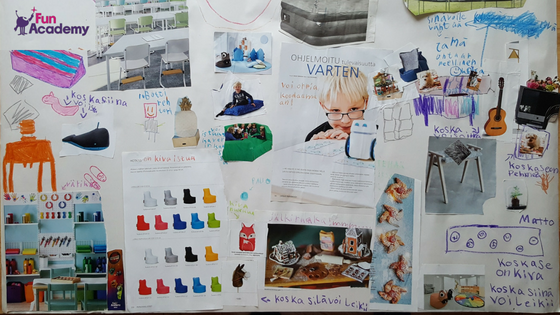 A group of eight year olds declaring future classroom designs should be ‘classy but practical’ is rather amusing. However, this statement is a clear reflection of how they view their current learning spaces and the changes they wish to see. Early years setups are often crowded with colors, designs, equipment and sounds. This can be overwhelming and distracting for little children learning to use their senses and understand the world. Moreover, introducing avant-garde designs into learning spaces also comes with a set of challenges. Most often these designs are not suitable to be used by little children and non-resistant to tear and wear. Thus, the children want a futuristic classroom to have modern and sleek designs which are child friendly and support everyday learning. Discover more Fun Learning ideas, activities and inspirations to support your little ones well-being.